The new Adams Arms XLP Low Profile Gas Block that fits under most manufacturer's rails is now available for purchase. Shooters are able to install the system under most major manufacturer rails while increasing performance and reliability with the simple design. Adams Arms' highly anticipated XLP Low Profile Gas Block is now available for purchase. One of the biggest complaints shooters had about the piston system was that the gas block did not fit under their handguard/ rail. Well Adams Arms was listening and answered the plea with their new low profile XLP. 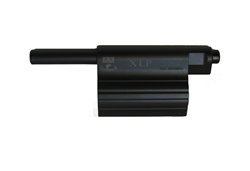 With the arrival of the XLP, shooters are able to install the system under most major manufacturer rails while increasing performance and reliability with the simple design. Since the XLP can fit under most manufacturer rails, this diminishes the need for a custom rail saving people more money and the hassle of switching out their current rail. Offering much more than its shorter stature, the XLP gas block has 5 adjustable settings for ultimate tune-ability, LifeCoat components for durability and corrosive resistance, and a 30% overall lighter design. It is also easy to install and requires little to no maintenance. The gun manufacturer offers many XLP products including Piston Kits that come in pistol, rifle, mid length, and carbine lengths; the Mid Tactical Evo Rifle in 16" and 14.5", as well as the Mid Tactical Evo Upper available in 14.5", 14.5" Pinned, and 16". These products are available for purchase online at http://www.adamsarms.net. Creator of the patented retrofit kit for the AR 15, Adams Arms strives to develop the most cutting edge technology to meet the needs of the modern day shooter. They are dedicated to developing products that improve performance and minimize maintenance costs saving customers both time and money. All Adams Arms products come with a Life-Time Warranty and are made in the U.S.A.